There is something special about rising early to greet the new day, to spend a quiet hour enjoying the serenity and beauty of Mother Nature without irritating bugs. The metal non-insulated knee wall system acts as a guard to keep rain and mud from splashing the inside of your Screen Room. Full Screen Room offers perfect outdoor feel with maximum view. Solid Insulated Laminated Wall Panel in the event you decide to transform your Screen Enclosure to and Glass Patio Enclosure. High Grade fiberglass coated in P.V.C. 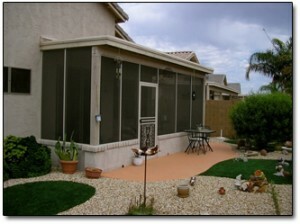 resigns resulting in a long lasting and durable Screen Room.